Unwind and dry your boots in front of the cozy fireplace and enjoy georgeous views of the slopes during a soak in our BRAND NEW private hot tub!! This spacious luxurious unit offers spectacular mountain views of Winter Park & Mary Jane Ski Areas with the slopes just a quick walk away. This private end unit boasts an oversized great room where families can gather and enjoy the views! Backs to forest with spectacular views of the mountain. Dual master suites each with private luxury bath and custom bedding. Two additional rooms upstairs with separate bath and loft just for the kids. Pack N Play and Highchair available. • Oversized Family Room with Vaulted Ceilings great for Large Family Gatherings! Perfect for families! 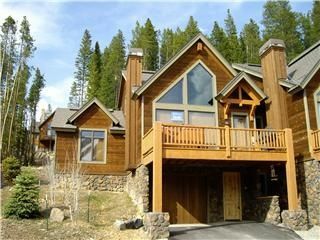 Main Floor Living/Dining Area – Log Timber Vaulted Ceilings with Beautiful Knotty Alder Woodwork - 2 Story Rock Fireplace. Door to private deck with Hot Tub & Gas Grill and Patio Furniture - Dining Room Table comfortably seats 8-10 with a Half Bath conveniently located off Main Living Area. Kitchen - Granite Countertops with Breakfast Bar and Stools 2, Top of the Line Stainless appliances Fully Stocked! (refrigerator w/ ice & water on door, dishwasher, gas stove w/ oven, microwave, coffee maker, toaster, blender, Crock-pot, mixer & all other dish needs. Two Main Level Master Suites– Custom bedding with beautiful decor -One King & One Queen. Both Suites have Master Baths w/ Double Sinks, Large Walk-in Showers & 1 Master w/ Jacuzzi Tub - King Suite includes Cable TV & DVD Player. Lower Level Mud Room - Perfect place to store Skis, Snowboards & Mountain Bikes! Washer & Dryer located in Laundry Room. Upper Level Full Bathroom - Tub/Shower Combo. Upper Level Loft includes computer desk and wifi internet!! We love our Lakota! We are two high school friends, one from America, one from Denmark, who decided to buy a place together with our spouses many years later. Here we spend our vacations relaxing with family and friends. Fantastic views, fabulous home, and right across from the slopes!! What could be better? Beautiful views of the ski runs and the village at night. The condo was beautiful. The view from the living room and hot tub was exceptional. All the rooms were spacious and as described. The kitchen was well stocked and made cooking dinner easy. It was nice having a private bathroom in each master too. Note - Although there is a free shuttle available at the end of the road (Green Line), and yes, you can walk to the slopes (took us 20 minutes without ski gear, lots of snow) ... we had a rental car, and paid for an overnight storage locker (West Portal), which was a MUCH better option. Parking lot fills up super early though. I recommend staying here. It's a beautiful end unit. The huge deck has a fantastic hot tub. There are 4 bedrooms with plenty of space. The cathedral ceiling and fireplace in the living room was the spot of movie night and chilling out. The kitchen was huge and modern. The entire place was very clean. And the best is that it's so close to the slopes! Love it. Beautiful home, great location, very comfortable. This was a great place for our family of 4 and our friends (family of 4). Everyone was comfortable with room to spare. Beds were fantastic. Kitchen was well stocked. The view was to die for! Only reason why I didn’t give it 5 stars is that some of the appliances (dishwasher, oven and grill) didn’t work great and the temps were a little tough to control in various rooms but it didn’t really negatively impact our stay. Would def recommend it! The home was spacious, well equipped, and close to Lyft bus stop. My family thoroughly enjoyed our weekend get away in this lovely condominium. Wonderful weekend in the mountains. The condo was spacious and very comfortable for the six of us. It was very nicely decorated and had a well stocked kitchen. We would definitely stay again if given the opportunity! The house was beautiful and kept clean. Beds were comfortable, great view and close to slopes. Owners were very responsive to any questions. We enjoyed our stay! The home is conveniently located across from the resort and a short drive to the downtown area and groceries! A wide variety of food with well priced menus. We are happy to negotiate longer stays. Just Ask!